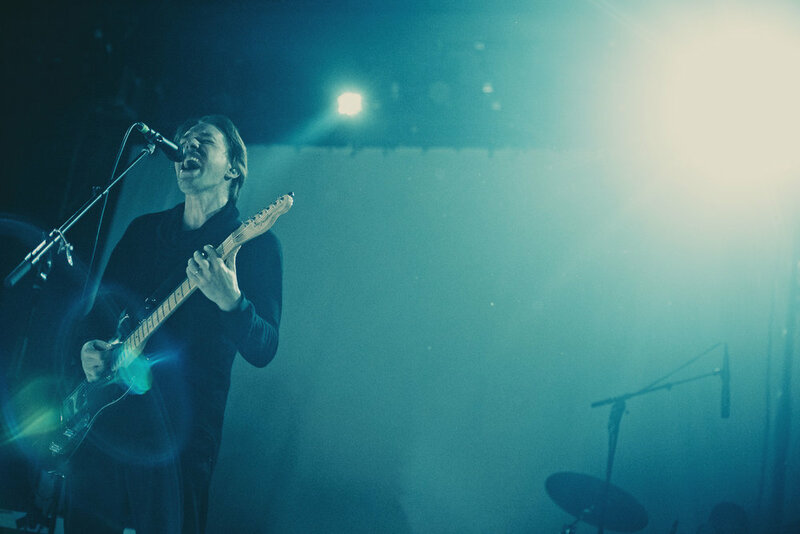 These visuals, birthed from the mind of lead singer, Jonas Bjerre, punctuated the night’s performance. From intensely imaginative to downright disturbing, these images danced across a screen the entire show, cast onto the background of the stage by a giant projector at the back of the venue. This just goes to show that the visuals—uncoincidentally, the namesake of their latest album, which this tour is supporting—are purposefully emphasized, but they’re still up for interpretation. You can make of them what you will. Some may find little meaning in them, while others may discover a new layer of artistic expression they can relate to. After all, Mew’s music has always conjured a unique, almost visual atmosphere. For instance, if you close your eyes during certain songs, you may imagine yourself careening through the utter blackness of space, dotted only by distant bright-white starlight—while a stark feeling of loneliness lingers, offset by the pure adrenaline of catapulting through asteroid fields. If space isn’t your thing, maybe you listen to “Snow Brigade” and imagine yourself floating over a white mountaintop with a cold blue sky as the backdrop; snow lightly falling on an otherwise dormant tundra sliding away below you. 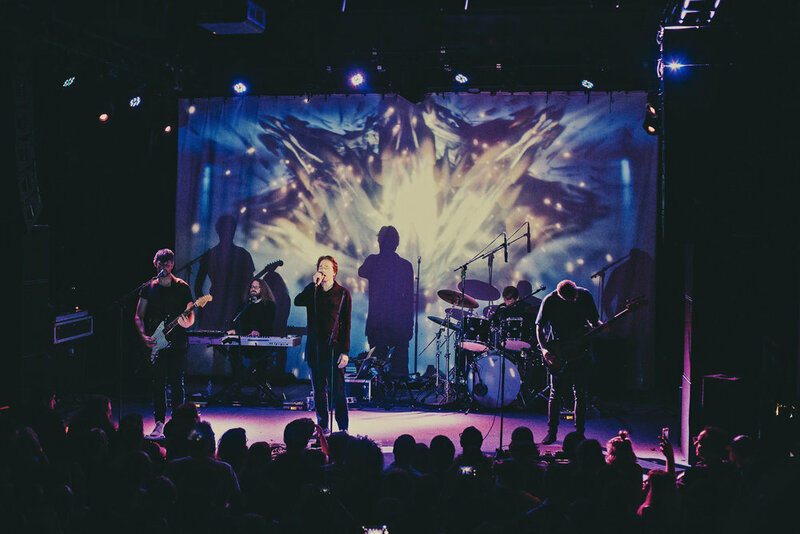 Whatever vision you experience while listening to Mew, you can expect it to collide with a multitude of sensations in concert. And that’s exactly what happened in Boston on August 8th. 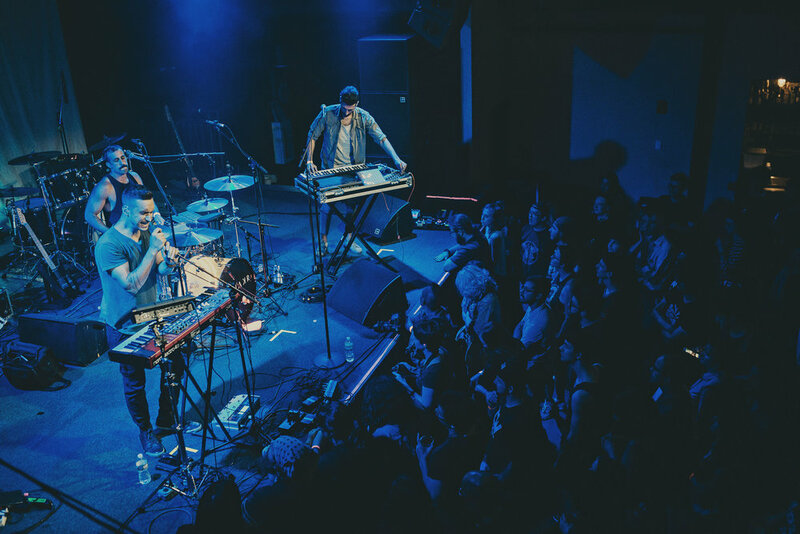 Their second song, “Special,” erupted with powerful, spare drum beats, coupled with pulsing red lights. This set the pattern for the rest of the night; harsh reds followed by bright blues, each song switching from one to the other. 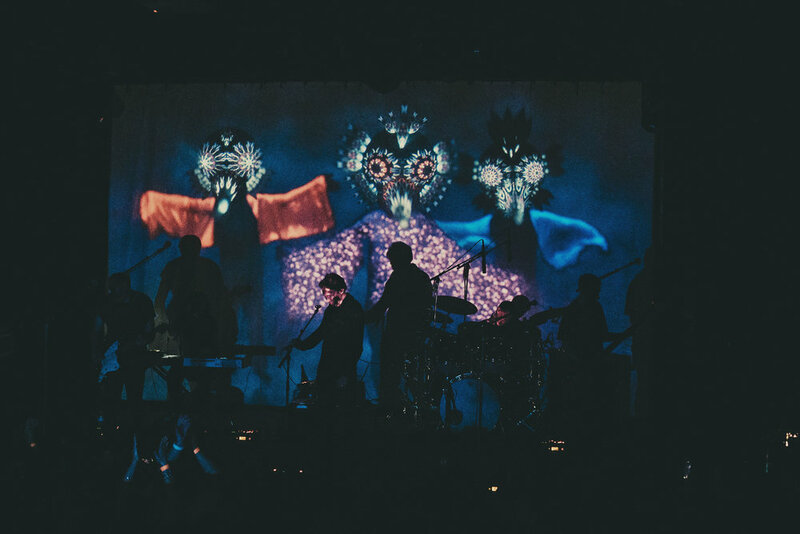 A few songs were exempt from the visuals in the background, influenced by these light changes alone, but this choice only made these songs stand out with a fierce, raw energy. To cool off after these musical bursts, the following songs were bathed in blue light, reminiscent of calming waters flowing quietly, occasionally interrupted with splashes of sudden vibrancy. Next up was “The Zookeeper’s Boy,” featuring some of the oddest imagery of the night—but if you’re an old Mew fan, you’re likely familiar with it. Just think: giraffes, ostriches, tigers with human faces...you get the idea. While bizarre, this song sticks out as a fan favorite. 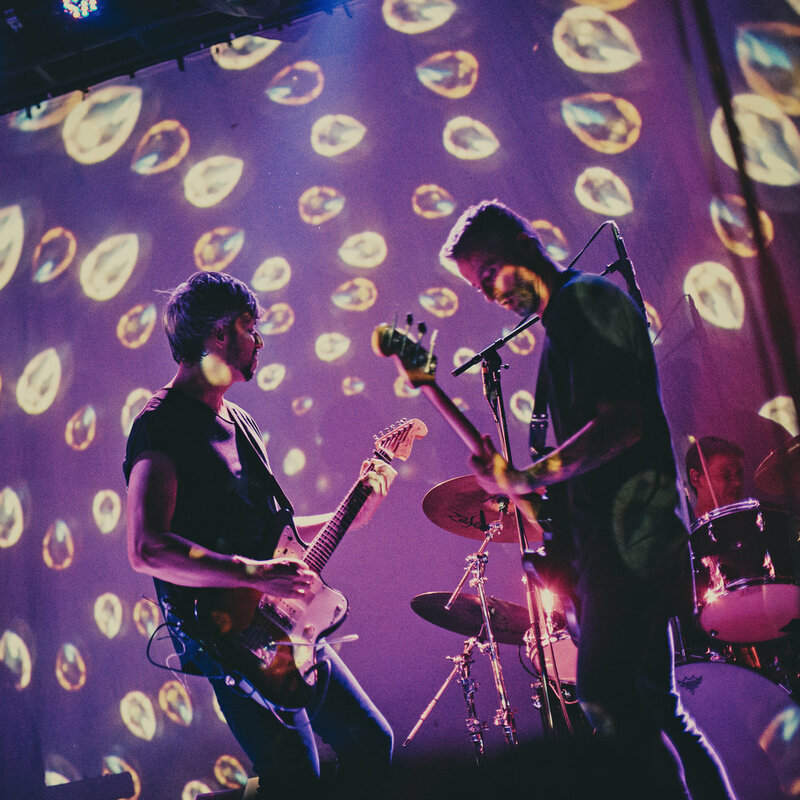 When “Satellites” kicked in, one of the strongest songs from their +- album, black space enveloped the screen, and the catchy beat carried the audience through a storm of cosmic energies and colorful galaxies. At this point, one of the amps screeched with a horrendous tearing sound. This minor technical difficulty derailed the momentum of the show, but it offered a lighter glimpse into the band’s personality. 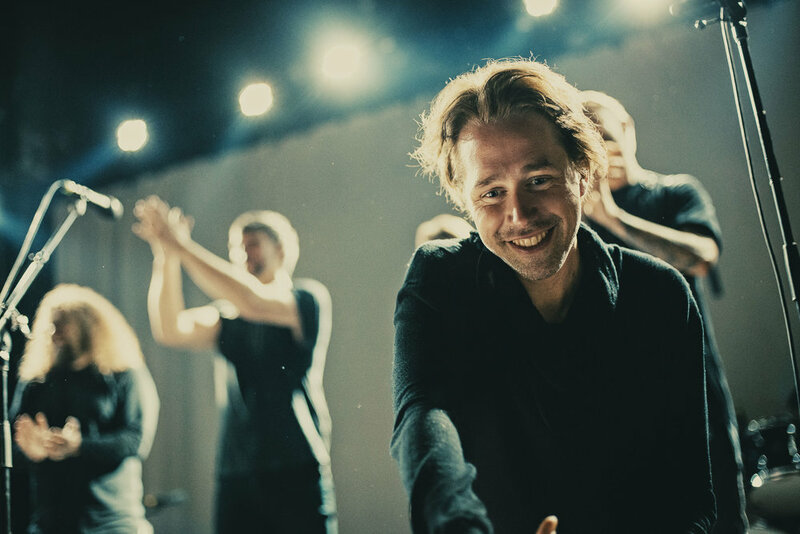 As a technician ran on stage, Bjerre studied the crowd and noticed a person in the front row, recognizing him from one of their concerts in Germany. It was a small moment, but a nice reminder that these incredible musicians were just like us. The next instant, the guitarist yelled out, “I’m back, baby!” and the show rocketed on. 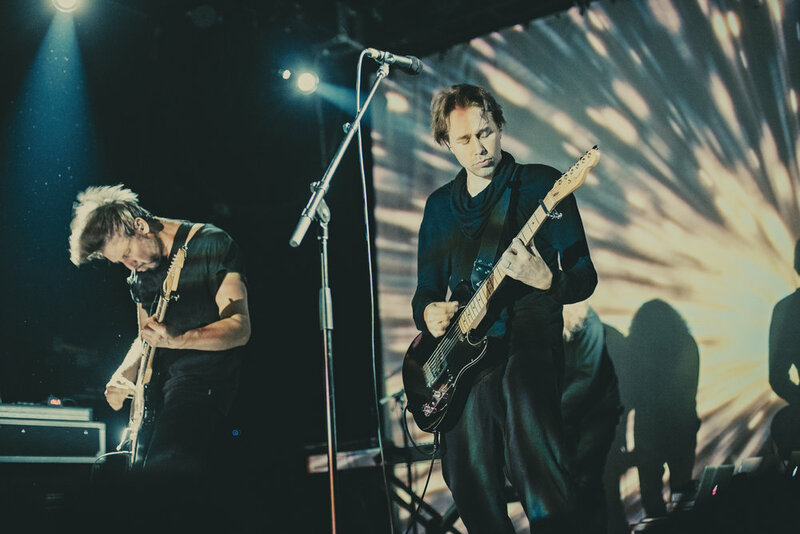 About midway through the night, Mew slowed things down with, “Start,” a slow, pared down song featuring the piano and vocals alone. The swooning, high-pitched vocals shone like a guiding light—completely captivating the audience. It felt like a much needed pause; a breath between act one and act two of the overall performance. Another notable song was “Twist Quest,” a single from Visuals. This tune’s time signature feels unpredictable and frenetic at times, but it’s oddly mesmerizing—and even more so when played live, especially with the lumbering silhouettes in the background, peering into the crowd with kaleidoscope eyes. It’s one of Mew’s more complex experiments; a weird, stuttering dance tune that no one else could pull off in quite the same way. The song that ended their full set, “Carry Me to Safety,” was especially poignant. Emanating a warm feeling of assurance, the tune carried the audience to a new level of musical expression. Bjerre’s stable and confident vocals added to this feeling, and as he trailed off with, “We’re just coming home,” the audience members’ chests swelled with the nostalgia of that sentiment. But it didn’t end there. To finish the night, Mew stacked their encore with jaw-droppingly good songs: “Nothingness and No Regrets,” “Am I Wry? No,” “156,” and, of course, “Comforting Sounds.” “Comforting Sounds” is, without a doubt, the best song to close a show—it’s the ultimate crescendo. After “156” faded away, all the band members left the stage, save for two. 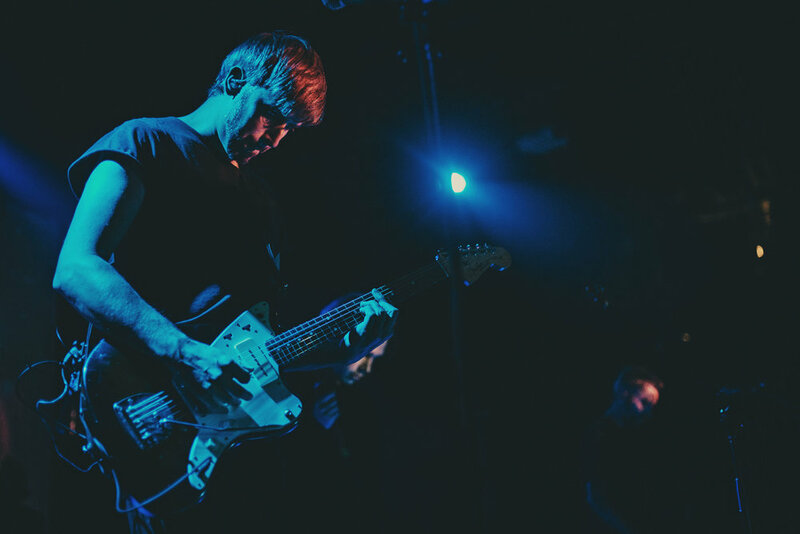 Slowly, the keys and guitar picked up the final tune with a gentle, patient start to one of the most epic songs of all time, immediately coaxing the audience into a quiet barrier of sound that felt like a warm embrace. 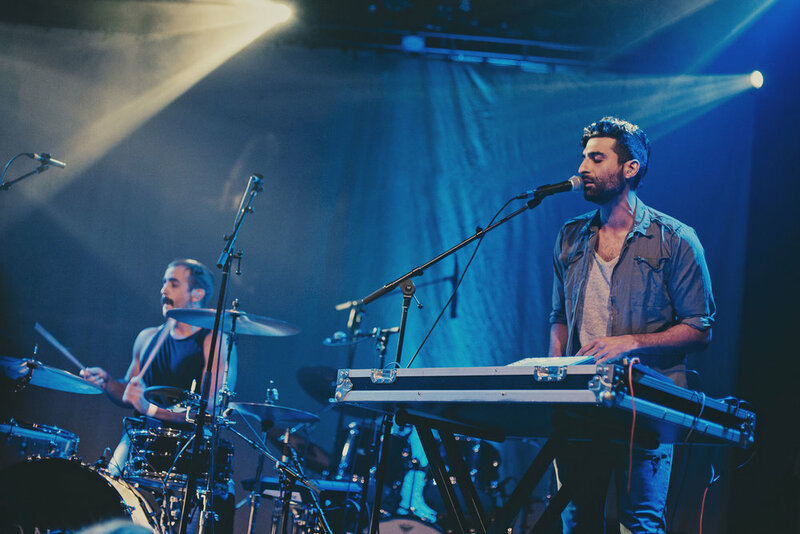 As the song built, the other two bandmates joined the stage, seamlessly adding to the sounds to create a fuller wave of music. By the end of this eight-minute prog rock gem, the entire venue was overflowing with noise—but the best kind of noise; the type you expect to hear when you go to a show—face-melting loudness that reverberates through your whole body and keeps your ears ringing for days. The best part about this noise? It didn’t feel aggressive or overbearing or unnecessary. No, it just felt comforting. The perfect closer with a simple but apt name. After the band took a bow, the crowd members shared the experience with those next to them in the room and chattered positively about it; everyone left abuzz with restless energy. 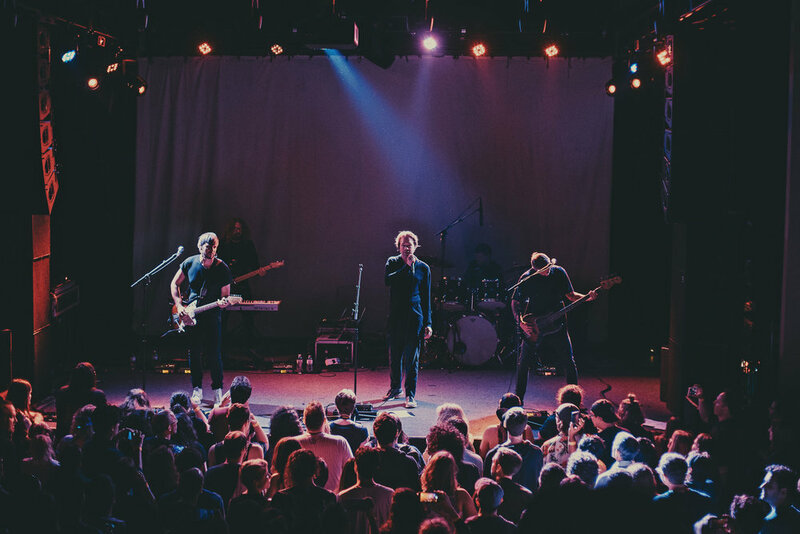 The fans at the show exemplified the type of community Mew’s built over the years—an inclusive, appreciative group of Frengers (a portmanteau of “friends” and “strangers”—and the name of their hit album). 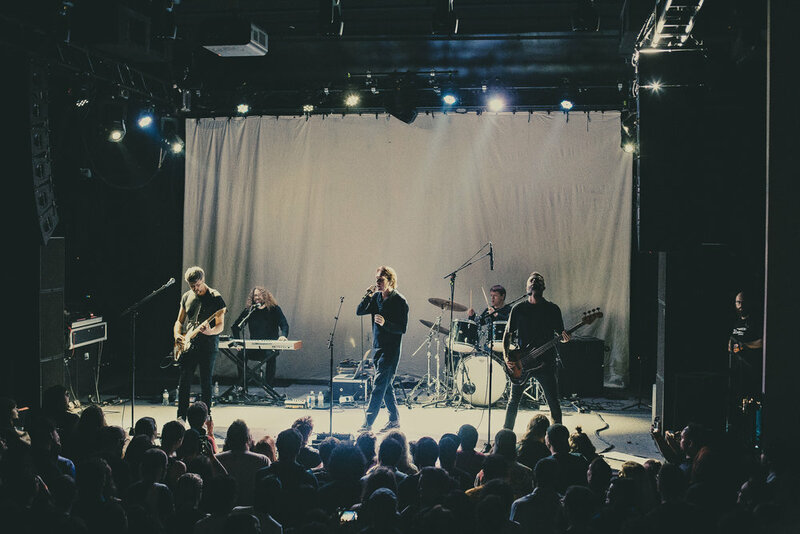 Needless to say, if you’ve never heard of these Danish rockers or haven’t had a chance to see them in concert yet, definitely check Mew out and swing by next time they come around. It’s an experience you’ll never forget.